Wouldn’t it be great if married couples could choose whether they wanted to share a surname or keep their respective surnames as they wish? 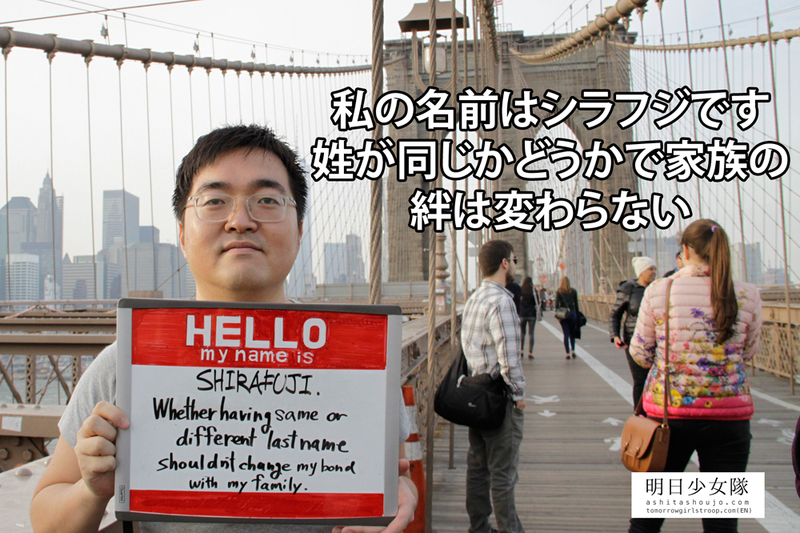 Japan is the only country that requires married couples to share a single surname. Statistics show that over 96% of the time, the woman adopts her husband’s surname. While there are couples who prefer sharing the same surname, there are others who face obstacles in the workplace after changing their surname, or feel as if they had lost a part of who they are. The government is pushing for both women in the workplace and marriage and childbirth. 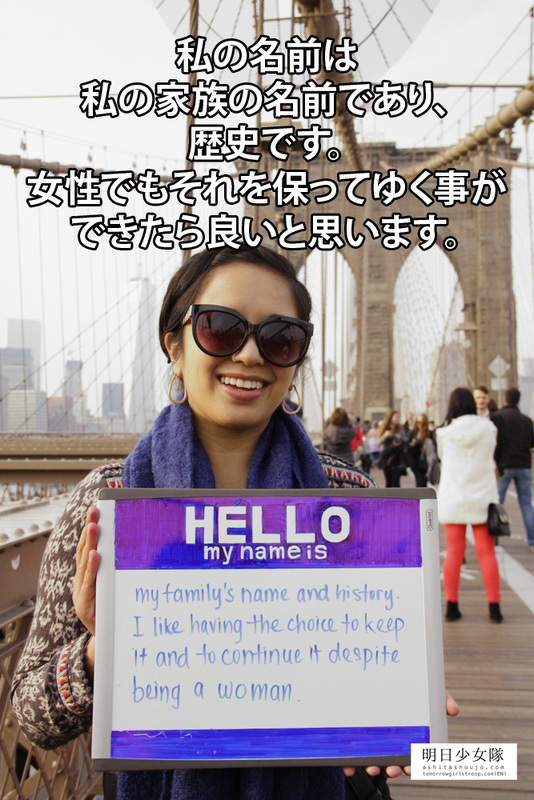 yet, how can Japanese women thrive in society when they aren’t afforded the basic right to keep their surname (and option available to their peers in other countries)? Although this issue has been on the table for 30 years, and has been criticized by other countries and the UN as being discriminatory against women, Japan has done nothing so far to rectify the situation. On December 16th 2015, Japan’s top court ruled that the current civil law requiring couples to adhere to a shared surname was constitutional and the court would not do anything to proactively change the situation. We were extremely disappointed with how the case ended, and trust was lost in the top court. The only viable option left is to demand parliament to engage in changing the law. The “Optional surname system” will not force every couple to keep their respective surnames. If couples prefer shared names, that is allowed, and if they prefer separate names, that should also be allowed. It is merely increasing the availability of options to suit diverse lifestyles. Under current law (civil code article 75) married couples must choose which person’s name to use, and must change accordingly. Many people experience inconveniences due to this requirement. For example, although cases are few, sometimes the husband will change his name to his wife’s name. In a December 4th article in the Mainichi Newspaper, one such man describes his case, in which he had to change all legal documents to reflect his new surname. Subsequently, he had to change the name under which his company was registered, which cost tens of thousands of yen.Additionally, despite having several achievements in the business world, he felt that by changing his name (identity), he was back at the beginning, and in reality he said that there was some actual financial loss. Many people have said that no matter how much they loved their partner, changing their surname left them feeling as if they were no longer themselves, and felt a sense of loss. World famous tennis player, Kimiko Date-Krumm talks about her experience after changing her name to Kimiko Krumm upon getting married. Since childhood, she admired the idea of changing her name to her partner’s. At first, if was new and exciting to be called by her new last name. But after a while, the excitement waned, and she was overcome by an unexpected sense of loss. The name “Date” was one she had built her career on, one with which she rose to fame as she became a noted and eventually world renowned tennis player. The name was finally recognized after years of hard work, and she was attached to it, but had let it go. Even among the members of Tomorrow Girls Troop, there were those of us that felt this loss of prior achievements due to the name change. One has said,”even just the process of changing the name for a bank account or credit card made me feel as if myself until now had been erased. Marriage should be a joyful beginning, but my heart felt heavy and I could not help the tears coming out.” Although there are different degrees of grief felt between individuals, many women feel similar emotions in these situations. 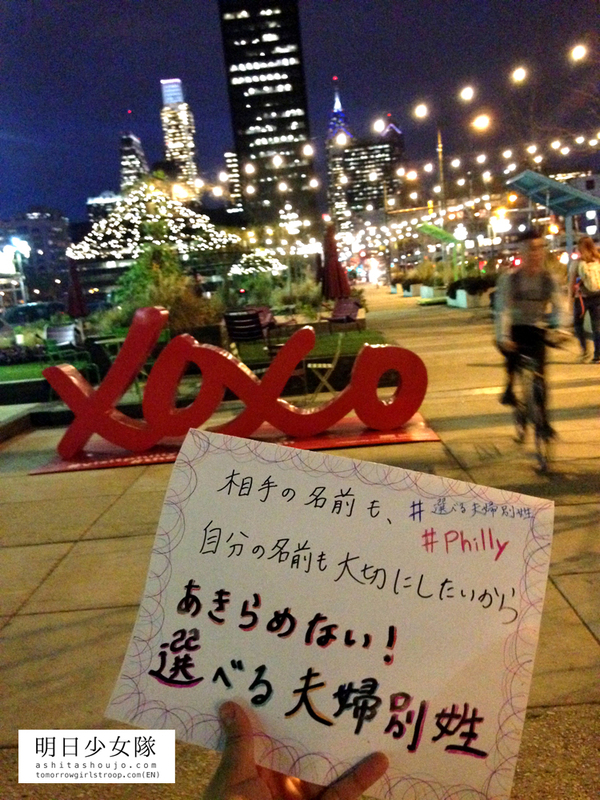 There are those who make the claim that having separate surnames will weaken the familial bond, but even with the current requirement of sharing a name, one in three Japanese couples get a divorce, and there is no concrete evidence of children in other countries feel anxiety over their parents having separate surnames, or families being broken over this issue. Moreover, as repeatedly states, this is not about forcing separate names on all couples. Those opposed to it can continue sharing their names as they wish. Opening up the option to keep respective surnames is a system that respects diverse lifestyles and families, and would eliminate the unnecessary social disadvantage, and alleviate the emotional burden. 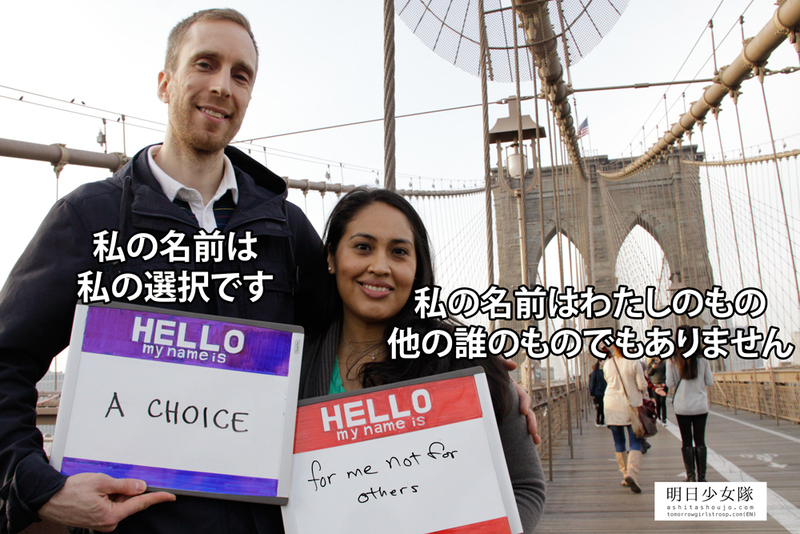 We believe that having the option to keep surnames is imperative to making Japan a more comfortable and livable society for all. In order to influence the parliament to make these necessary changes, we must make our voices be heard. “Public opinion” is composed of our individual voices coming together. Let’s continue to raise our voices to make optional surnames a reality!